Transition state spectroscopy of the photoinduced Ca+CH3F Reaction. The Ca*+CH3F → CaF*+CH3 reaction was photoinduced in 1:1 Ca···CH3F complexes formed in a supersonic expansion. The transition state of the reaction was explored by monitoring the electronically excited product, CaF, while scanning the laser that turns on the reaction. 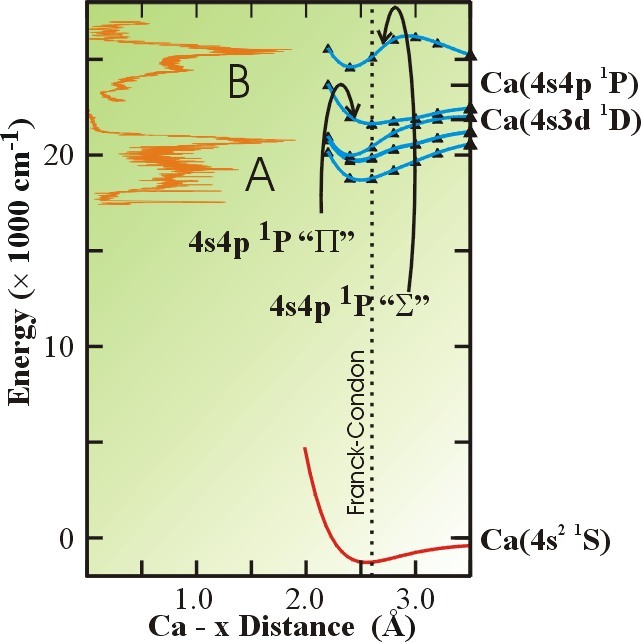 Moreover, the electronic structure of the Ca···CH3F system was studied ab-initio by associating a pseudopotential description of the [Ca2+] and [F7+] cores, a core polarization operator on calcium, an extensive Gaussian basis and a treatment of the electronic problem at the RSPT2 level. The present experimental results, a comparison with results of a previous experiment where the Ca···CH3F complexes are deposited at the surface of large argon clusters, and the present calculations allowed us to disentangle two reaction mechanisms, one involving a partial charge transfer state, the other involving the excitation of the C-F stretch in the CH3F moiety prior to charge transfer. Experimental data on the left of the figure : action spectrum for producing electronically excited CaF in a 1:1 Ca···CH3F complex. The potential curves on the right side of the figure correspond to the ground and excited singlet state of the complex calculated ab-initio. The distance between Ca and CH3F is refered to a Ca-x distance where x is a dummy point set at 0.12 nm from C along the C-F bond. Most of band B is assigned to excitation toward the molecular state labelled “4s4p 1P Π“ with a significant energy deposited in the C-F stretch.